1. So, I am kind of obsessed with bread tabs :) I somehow find them very aesthetically pleasing and I have been collecting them for awhile now. 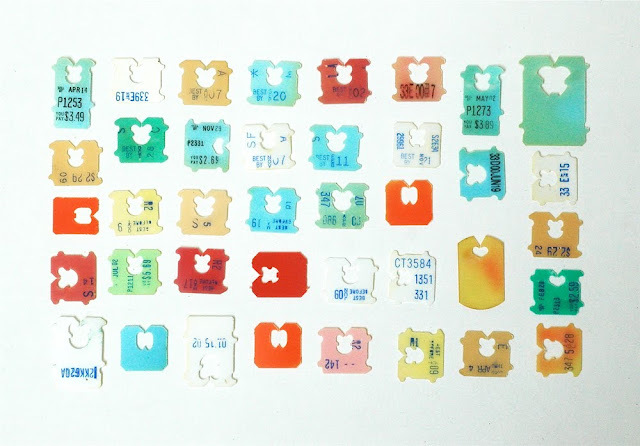 It was cool to find that I wasn't the only crazy one out there collecting plastic bread tabs. 2. Mike Perry has notebooks in the school supply section at Target! I am very excited about this. 3. Next weekend we are having an open house for our condo and I am crossing every finger I have that someone wants to buy it. I just want a house, like yesterday. 4. I am going to Massachusetts in about three weeks with a day trip to NYC. I have been all over the place in my life but I have never been to New York City. What are some things that I MUST see while I am there?? We are going to see Wicked on Broadway but that is our only scheduled thing so far. I am so excited!! I have been working outside all day and I am bushed! So now I am off to draw in my new Mike Perry notebook, read some Sherlock Holmes, and then...to bed. I wanted to see Wicked SO bad, but didn't get the chance - had to see Chicago instead. But it was still good! My favorite thing in NYC was probably Lombardi's Pizza... seriously, best ever. Get their reg cheese pizza, but with extra cheese!! Oh, and also the Alice in Wonderland statue in Central Park. It's pretty magical. But only because Robert Pattinson sat on it. Oooh fun! I love NYC! When I was there I went to Tinsel Trading Co. (http://www.tinseltrading.com/index.php). Martha Stewart called it her favorite store in the world. : ) And I also loved B&J Fabrics... if you can't hit up Mood (from Project Runway) then I think B&J is a close second. Hmmmm... I highly recommend Grays Papaya for a good old New York hot dog too. P.S. Your package is on its way. And there is a free gift so keep an eye out! You have to walk the newly opened part of the High Line. Great views and just a really cool experience. Also, try to win tickets for Shakespeare in the Park through the online drawing (since I guess you are not up for waiting from 6am to 1pm). The plays (measure for measure & All's well that ends well) are phenomenal! Mh, I#d have so many tips for you that just don't fit in here but a day is also not much for this city. Anyways, have fun! I'm going to NYC the 22nd for Kleinfield's dress shop and Chicago on broadway, my friend and I almost say wicked but we had seen it on tour and want to see chicago now!!! I hope you have fun!! And I agree with Haley on the statue but not because of Rob lol. i would love to see wicked. good luck selling the condo! Love your collection of bread tabs. They look so cute. I live in Holland and here the bread tabs are less special I think, but maybe I can send you a few in a letter. And p.s. I love your blog!